Bingo rooms are differently themed on whichever online casino you enter for a great game play and rewards. Coral Bingo has gone all out with their specially themed bingo rooms. All rooms are ranged from: Free Bingo, Progressive Jackpots, 90 ball bingo, 75 ball bingo and 5-line bingo. These rooms are not literally named, but have input a completely unique theme into the bingo rooms. Based on the longest running and very popular iTV soaps. You can now play 90 ball Emmerdale bingo from your desktop or mobile. The game offers great prizes on 1st Line, 2nd Line and Full House wins. Start playing free bingo for eight hours a day in the Allsorts Bingo Room. This is otherwise known as Superbooks. By using the Superbooks ticket, you have the option to choose free tickets with much higher prices. 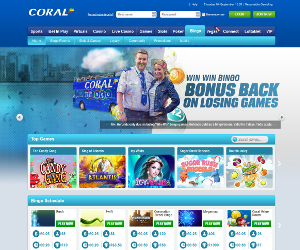 Try out the new Rainbow Riches 40 Ball Bingo room right here at Coral Bingo! Themed on the greatly popular Irish themed slot game! The room is open from 9am to 12pm every day! Here, the leprechaun awards you different prizes for a certain number of steps on the rainbow. Corrie and bingo fans both enjoy this extravagant Coronation Street themed bingo room. This 90-ball bingo room features a majestic Golden Cobbles progressive jackpot! Enjoy mini games such as: The Kabin, Weatherfield, Roy’s Rolls, Underworld and much more! Go bonkers in the 50-ball bingo room Coconut Island! This exotic bingo room can be played from your desktop or tablet. Prizes are awarded on 1st line wins and full house wins. Trigger the Treasure Chest jackpot by claiming the house in fifteen calls or less! The room is open from 10am to midnight ever day!